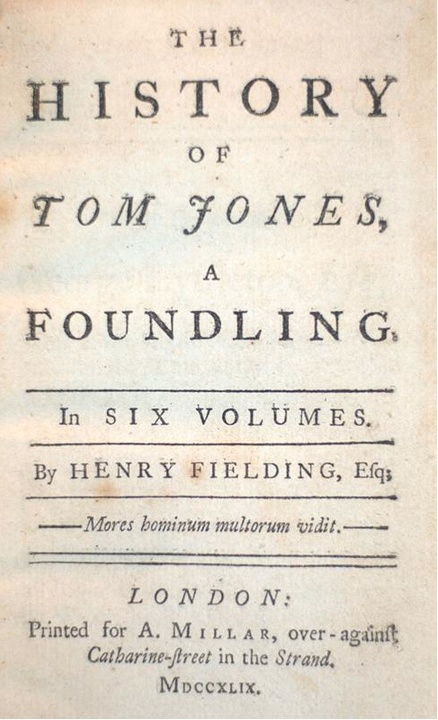 On this day in 1749 the first edition of Henry Fielding’s “The History of Tom Jones” was published in London. It is considered one of the earliest English novels and is included in W. Somerset Maugham’s, “Great Novelists”. It contains 346,747 words and is organized into eighteen small books proceeded by a descriptive chapter. Fielding was known for his humor and sarcasm which he directed at British government. He was primarily a dramatist and early novelist. His first play was published in 1728 which received mixed reviews. The Theatrical Licensing Act of 1737 would put an end to his involvement with theater and set him on his path as a novelist. Fielding would go on to build a following and today is considered one of the forefathers of the modern novel. When “The History of Tom Jones” was published, its structure was unlike anything that had preceded it. As others published fiction under the guise of ‘Memoirs’ or ‘letters’ he admitted outright that his story and characters were fictionalized. And the sheer number of characters and how they were used along with the complexity of the plot raised it above simple prose. The first edition was published in six volumes in a run of only 2,000 copies which sold out prior to the books official release date of February 27, 1749. The copies of the second issue also went quickly and by the end of 1749 the book had been through three printings. The third issue was condensed into a four volume set due to the lack of materials. By the end of the first year nearly 10,000 copies had been sold, making it an instant hit. “Tom Jones” has gone on to become a classic and remains in print today. The book is listed on numerous ‘Best of’ lists has been the source for several movie versions and teleplays.